How do you like your serial killers? Reality based or complete fantasy? Which is less disturbing and easier to watch? Two serial killer TV series recently premiered within a few days of each other and may help you answer these questions. Mindhunter, a Netflix original, follows the early days of the FBI’s Behavioral Science Unit. If mention of the BSU brings Silence of the Lambs to mind, think again. 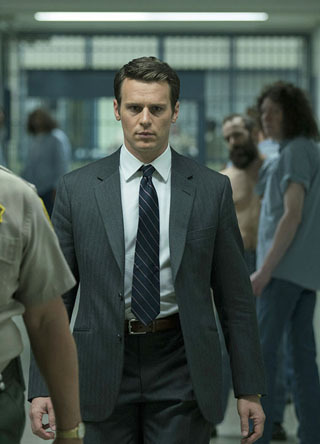 Mindhunter is a retro, 70s docudrama focused on process and interviews more than the actual crimes. 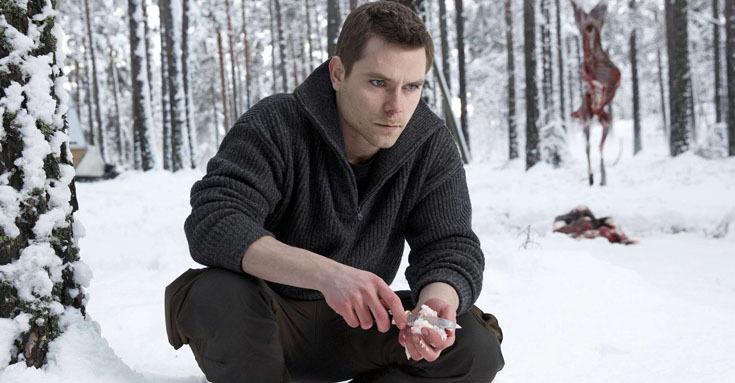 If a fictional, cold-blooded killer is your preference, consider Modus, a popular Swedish thriller now on Walter Presents. Holden Ford (Jonathan Groff, right) is an earnest young g-man. The opening scene, a high pressure hostage situation, shows off his skills at communicating with criminals (despite an unhappy result). Ford soon meets up with Bill Tench (Holt McCallany), a more seasoned agent. The two become partners, traveling the US to train local law enforcement how to handle unusual homicide cases. Ford and Tench address the psychological aspects of killers. It’s the era of Son of Sam and not long after the Manson family murders. It’s a new time for the FBI, the counter culture is in full swing – or perhaps in decline – and our team pushes against the limits and comfort zone of how the FBI deals with criminals, crazy or otherwise. They start to interview mass murderers – the term serial killer was not yet in vogue – which makes their boss even more uncomfortable. The thing is, they start to have results. Emboldened, they bring much needed feminine energy to the team. Professor Wendy Carr (Anna Torv, last seen in the FBI as Agent Dunham in Fringe) brings methodology to their approach, as well as another analytical mind for brainstorming. Her academic discipline conflicts at times with the agents’ more free wheeling interview techniques. 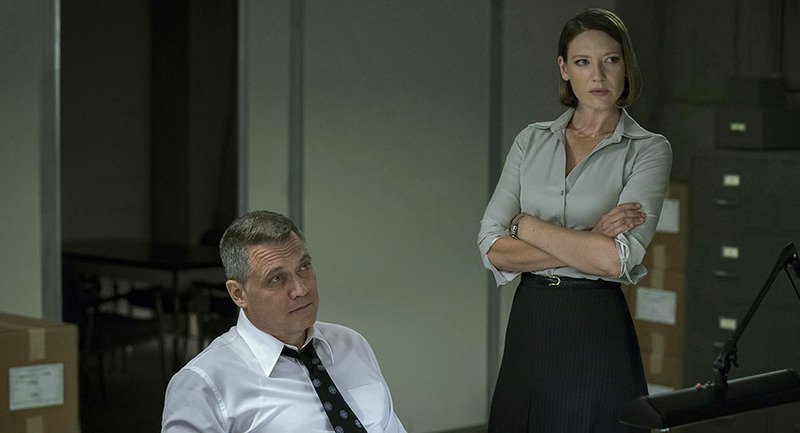 These intra-team conflicts are part of the attraction in Mindhunter. Another big component is Ford’s personal life. He meets a young woman, Debbie (Hannah Gross, right), early on, one who is his intellectual equal. He enjoys the mental challenge while she broadens his horizons and tries to loosen him up. But it’s the serial killers we came for. We don’t usually seem them in action. It’s mostly interviews, in prison, Ford and Tench verbally coaxing and sparring with their subjects to figure out what makes them tick. It’s the kind of job that gets under your skin, and it’s interesting to see the impact on the agents as Mindhunter progresses. It’s not a typical serial killer TV show. The series’ style brings Zodiac to mind, the 2007 film that followed cops and a journalist on the trail of the Zodiac killer. It’s a procedural based on real life events, with a fair amount of fiction mixed in for dramatic purposes. Mindhunter, the TV series, is based on a book by John Douglas, a former FBI agent in the Behavioral Science Unit. It was developed for TV by Joe Penhall. 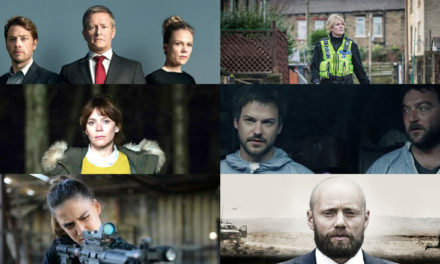 The ten episodes on Netflix range from 35 – 60 minutes. Fans of true crime stories, in particular, will find the show fascinating and, perhaps, disturbing. We look forward to Mindhunter season 2. More handsome than the average serial killer? 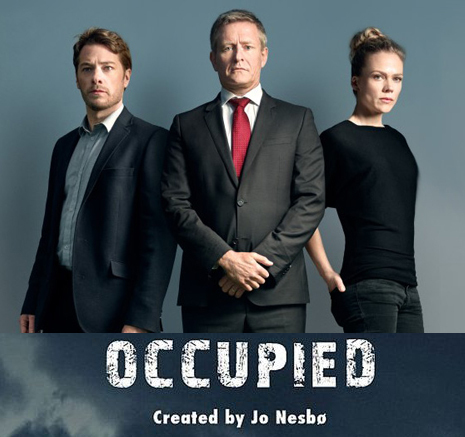 This 2015 TV series, call it Nordic Noir if you like, is quite popular in Sweden. We’ve been waiting for it to arrive on one of the readily available streaming channels in the US. Generally speaking, it does not disappoint. Modus is the tale of a serial killer and his stalkers, one a detective and the other a profiler with experience in the FBI’s Behavioral Science Unit. Inger Johanne Vik (Melinda Kinnaman) is that profiler. She’s retired from active duty to research and write, but when it becomes clear a serial killer is at work in Stockholm and surrounding areas, she is lured by the police, specifically, detective Ingvar Nymann, to help with the case. Both Vik and Nymann happen to be near the scene of the first murder when it happens. In addition, Vik’s daughter Stina is a witness to part of the crime. She’s preteen and on the autism spectrum. What she knows usually stays bottled up. What Vik and Nymann don’t know is whether she was an actual witness and, if so, whether the killer saw her. There is more to the story. One of the victims is a female bishop. Her husband Erik is played by Krister Henriksson, our favorite Wallender. Erik obstructs the investigation, as well as questioning from his son and daughter in law. He is hiding something. Modus gives viewers credit, not going out of its way to explain relationship status and connections between characters. We figure that out ourselves. Despite a couple of plot holes, it’s a smart series. The events in Modus happen during the Christmas season. Stockholm is clean, brightly lit in the night scenes, and often covered in snow. There are several short, violent scenes, and the series becomes darker as motive for the crimes becomes clearer. As a tale of fiction, it may be easier to accept than the real life delusions and paranoia portrayed in Mindhunter. Modus was developed by Mai Brostrøm and Peter Thorsboe based on a book, Frukta Inte, by Anne Holt. As with most Scandinavian thrillers, much of the appeal is the realistic characters and actors that seem like regular folks. 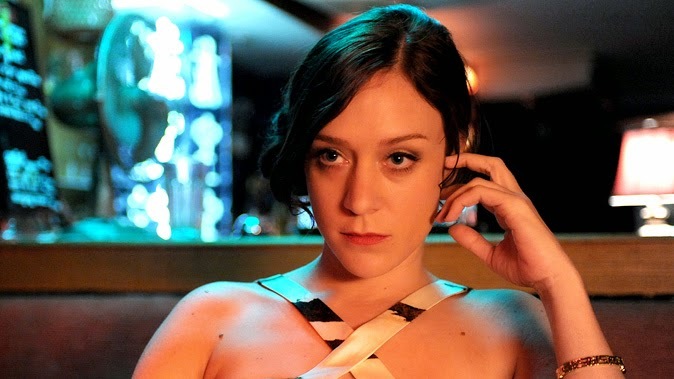 Season one’s eight episodes are on Walter Presents. Modus season 2 begins airing in Sweden November, 2017. We don’t know when it will be available in the US.